The Woods at Rock Raymond is a wonderful 55+ community ideally located in Chester County, Pennsylvania. Homebuyers can find a low-maintenance townhome that meets their size and style requirements. The Woods at Rock Raymond is a picturesque neighborhood that backs up to untouched wooded areas. This age-restricted neighborhood in Downingtown offers a tight-knit sense of community for its active adult homeowners. The Woods at Rock Raymond is a neighborhood that encourages residents to enjoy the great outdoors with its beautifully landscaped streets. Though there is no on-site clubhouse, residents can utilize the lighted tree-lined walking trail to exercise on a nice day. The wooded areas that surround the community also include nature walking paths. Homebuyers can find a new construction or previously owned townhome offered in eight unique models. Customizable floor plans range in size from 1,465 to 2,181 square feet with two to three bedrooms and two or two-and-a-half bathrooms. Some units include a one-car garage while other units include a two-car garage. The attached homes throughout The Woods at Rock Raymond include desirable design features like first-floor master suites, maintenance-free siding, and brick accents. Additional standard features include full eight-foot basements, dramatic nine-foot first-floor ceilings, and hardwood floors in the foyer. Residents of The Woods at Rock Raymond enjoy owning a lock-and-leave home where they can come and go as they please. Homeowners never have to worry about landscaping and lawn maintenance as well as snow removal and exterior-building maintenance because it's handled by a professional management company. This maintenance-free homeownership gives residents more time to explore all that Chester County has to offer. 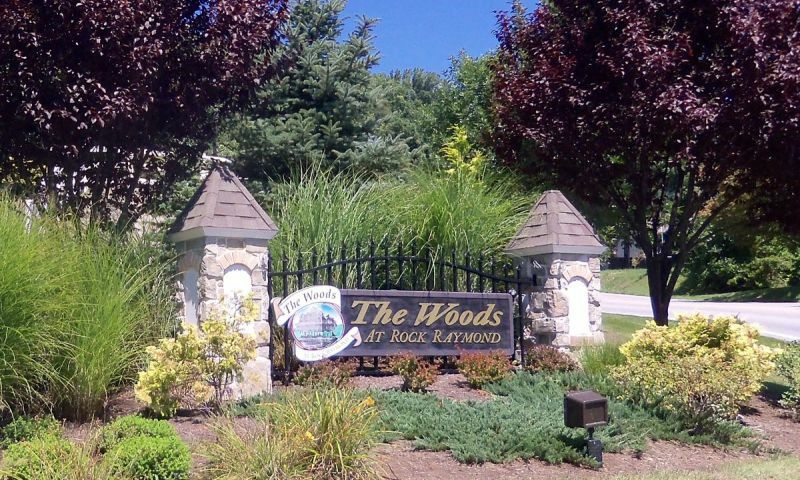 The Woods at Rock Raymond is located in Downingtown near major roadways and public transportation. City Center Philadelphia is about 40 miles east and accessible via Downingtown’s SEPTA train, which offers senior rates. Closer to home, seven parks throughout the area are available for hiking, biking, sailing, and picnicking. Golf enthusiasts will be pleased to know that they’re near Ingleside Golf Club, Downingtown Country Club, and Whitford Country Club. Downingtown is a wonderful city that has plenty of restaurants, grocery stores, public libraries, and access to medical facilities. Active adults will love The Woods at Rock Raymond for its thoughtfully designed homes in Chester County, Pennsylvania. Check back soon for more information on the lifestyle in The Woods at Rock Raymond. 55places.com is not affiliated with the developer(s) or homeowners association of The Woods at Rock Raymond. The information you submit is distributed to a 55places.com Partner Agent, who is a licensed real estate agent. The information regarding The Woods at Rock Raymond has not been verified or approved by the developer or homeowners association. Please verify all information prior to purchasing. 55places.com is not responsible for any errors regarding the information displayed on this website.